How to make the best cheesecake bars with fresh blueberries and lemon. Jump to the Blueberry Lemon Cheesecake Bars Recipe or read on to see our tips for making them. 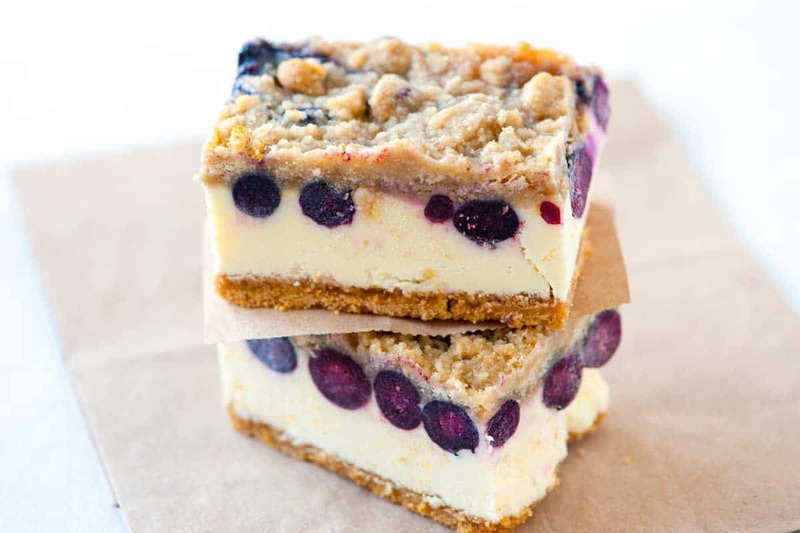 There’s something dreamy about this cheesecake bar — maybe it’s the soft yellow hue of the lemony cheesecake against the fresh blueberries or maybe that soft buttery top. Whatever it is, we love them and think you will too. 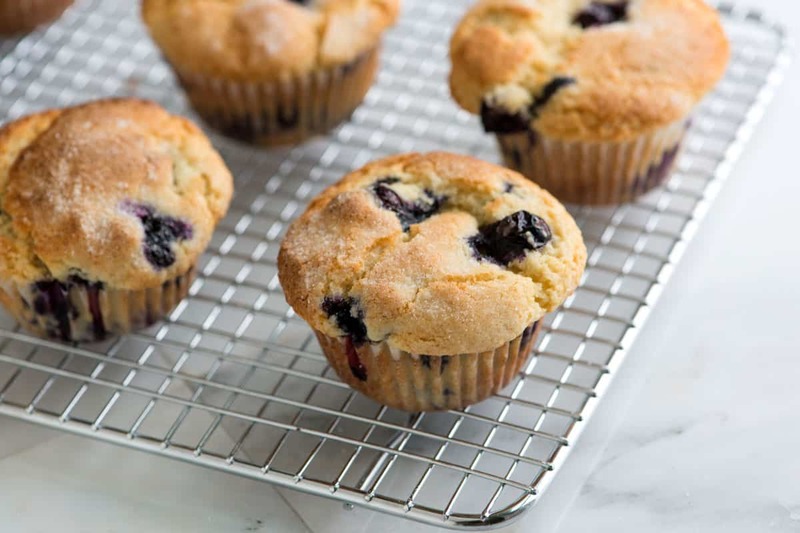 YOU MAY ALSO LIKE: Our Ridiculously Easy Blueberry Muffin Recipe with a quick recipe video showing you how we make them. These cheesecake bars come together very quickly — especially when you use a food processor. A food processor makes quick work of the crust made with graham crackers, sugar, lemon zest, and melted butter . If you don’t have one, though — add the graham crackers to a plastic bag, find something heavy and bash the heck out of them until fine crumbs then you can just stir everything else in with a spoon. The food processor can be used for the cheesecake filling, too. 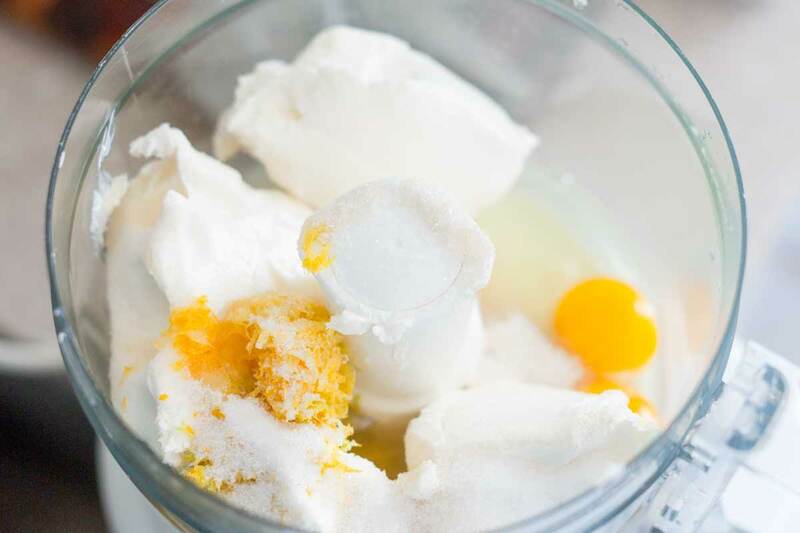 Combine cream cheese with eggs, more lemon zest, lemon juice and sugar. Give it a whirl then pat the crust down into a baking pan and top it with the cheesecake layer. 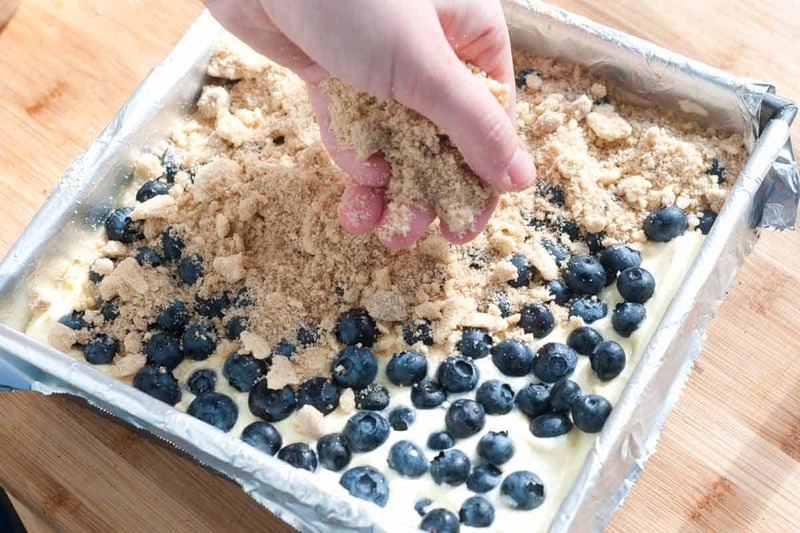 Blueberries are scattered on top of the cheesecake layer and then we finish the bars with a brown sugar crumble topping. After some time in the oven the bars are done. YOU MAY ALSO LIKE: How to make the best lemon bars with a crisp buttery crust and a creamy tart lemon topping. 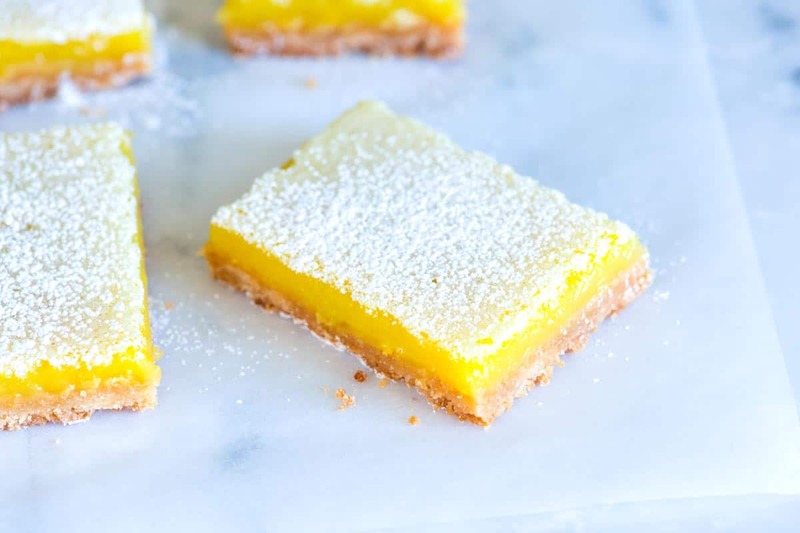 Jump to the Lemon Bars Recipe. 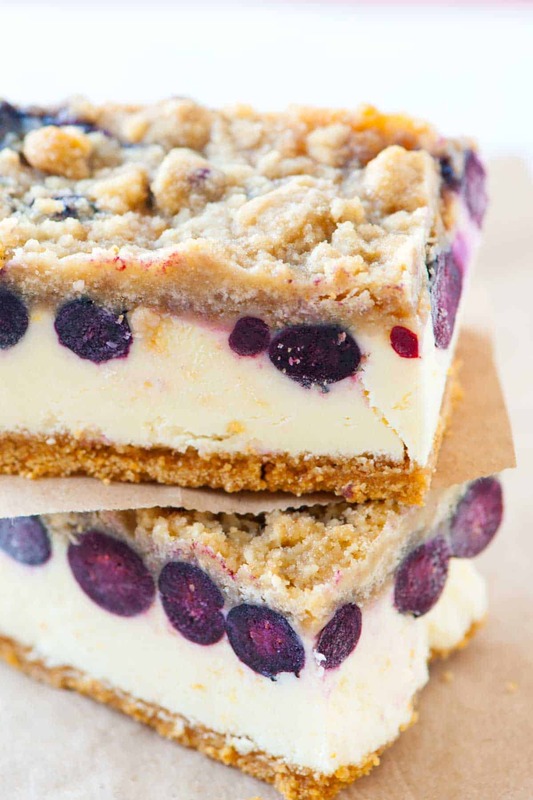 These cheesecake bars are a dream. The lemony cheesecake matches perfectly with fresh blueberries and that buttery streusel really makes everything work. If you can’t find fresh blueberries, try ripe red raspberries or even blackberries. We really prefer to stick to fresh berries for this, not frozen, since we like how the fresh berries stay intact while baking. When making these cheesecake bars, you really want them to be cold before cutting, so there is some time spent chilling the baked cheesecake. To speed things up a bit, place the cheesecake into your freezer for 30 minutes instead of the refrigerator for 1 hour before cutting into bars. 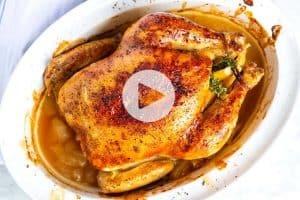 Heat oven to 325 degrees F. Line an 9-inch square pan with aluminum foil and lightly spray with non-stick cooking spray. Add graham crackers, 2 tablespoons granulated sugar and 1 teaspoon lemon zest to the bowl of a food processor. Process until fine crumbs form. Add the melted butter then cover and process until blended. Press graham cracker crumb mixture evenly into the bottom of the pan and bake until lightly toasted, about 10 minutes. Cool 10 to 15 minutes before adding the cheesecake layer. While the graham cracker base cools, make the cheesecake bar filling. Wipe the food processor mostly clean with a paper towel then add cream the cheese, eggs, 2 tablespoons lemon zest, lemon juice and sugar. Process until smooth and creamy. Spoon cheesecake filling over crust then top with blueberries. Make the topping by adding brown sugar, flour, and cold butter to a medium bowl. Cut the butter into small cubes and then add them to the bowl. Using your fingers or a fork work the butter into the flour and sugar until crumbly. Scatter topping over the blueberries. Bake until the topping is lightly browned and center is almost set (center should jiggle only slightly when moved), 35 to 40 minutes. 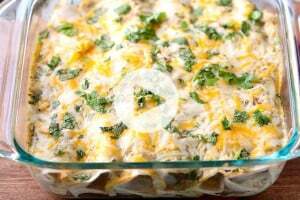 Cool 1 hour at room temperature then refrigerate about 1 hour or until chilled. (Or freeze for 30 minutes). Cut into 9 bars. 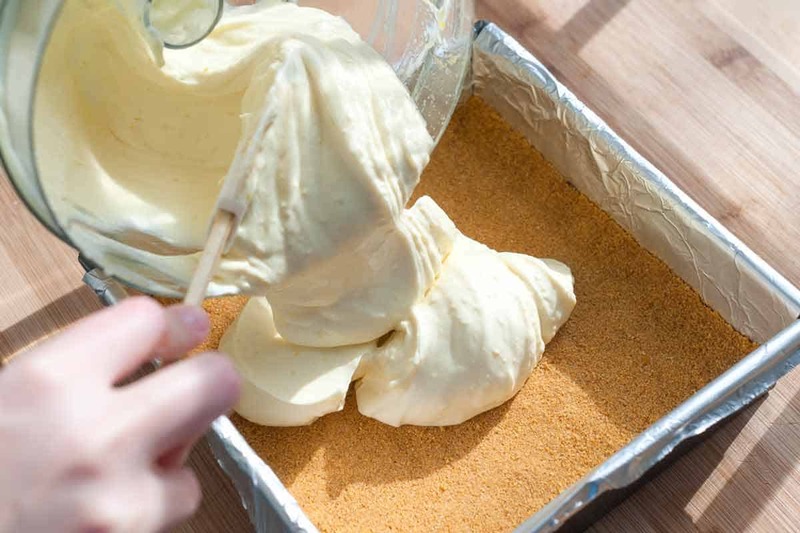 If you do not have or want to use a food processor make the crust by crushing the graham crackers in a plastic bag with something heavy such as a pan or rolling pan. Add the crumbs to a bowl along with 2 tablespoons of sugar, lemon zest, and melted butter. Stir until blended. Then for the cheesecake filling, use a hand blender to blend cream cheese, eggs, lemon zest, lemon juice and sugar until smooth and creamy. We made these for Betty Crocker not too long ago and they were a hit, so we just didn’t feel right not sharing with you! 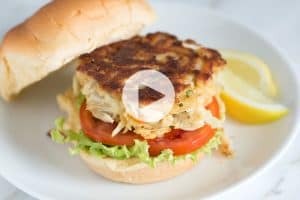 I have made these several times and they are PERFECT just as the recipe is. I wouldn’t change anything. Everyone who has ever tasted them is blown away by how amazing they are! Hi Grace, You are welcome and thanks for being so kind. Unfortunately, we have not had any experience baking with stevia so it is hard for us to say. That said, since this isn’t a cake or complicated baking recipe, you can probably get away with it. I’d check the container and see if there are any suggestions for substituting sugar for a guide. I made these for a dessert social for new parishioners at my church last night. I mistakenly baked the crust before I realized the one teaspoon of lemon zest I had set aside for it was still on my counter. I thought there was too much crumb topping so I refrigerated half of it so I can use it when I make these again very soon. Also, after reading some of the comments that the cheesecake layer is too lemony, I tasted it and I thought it needed to be tempered with a half-teaspoon of vanilla. I had to bake it almost twice as long as the directions state, but that’s typical of my oven. When I shook the dish and the center was only SLIGHTLY jiggly, I knew it was perfectly baked. These squares are creamy and delicious! I will definitely make them again and I have the extra graham cracker crumbs to motivate me to do it! Thank you for a great recipe! Hi! 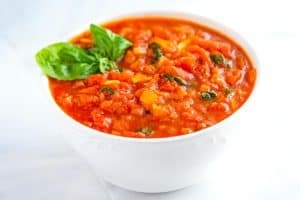 Just tried your recipe and it is delicious! My only problem is my filling is a little runny and doesn’t appear as creamy and thick as yours. Still chilling it hopefully will harden.